Affirmations-366Days#175: I make a literary pilgrimage as a purposeful act of devotion. In a few days I will travel to London for both work and pleasure. I’m super excited. The last time I visited London was 25 years ago, right before I started graduate school. How time flies! Unfortunately, the last time I was there I didn’t get a chance to explore much of London’s great literary history. That won’t happen this time. I can’t wait to walk the same streets of Charles Dickens, Oscar Wilde and Virginia Woolf and be immersed in their specific histories. My upcoming trip reminded me of the importance of making literary pilgrimages, hence my affirmation. Pilgrimages are purposeful trips meant to show devotion and help foster insight and gratitude. Making a pilgrimage in service of our creativity is fortifying. My trip also reminded me of a post that I wrote on this topic in 2014. Below, I share the powerful experience I had of taking my first literary pilgrimage to learn about the remarkable Harriet Jacobs, escaped slave and author of Incidents in the Life of a Slave Girl. 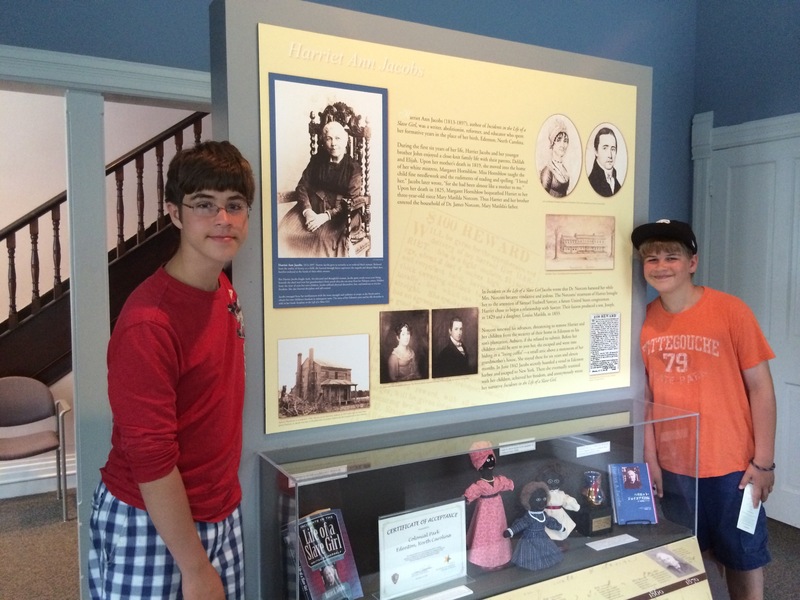 I decided to use a recent visit by my godsons as motivation to make a literary pilgrimage to visit the town of Edenton, NC where Harriet Ann Jacobs lived and made her escape from slavery. Harriet Jacobs wrote Incidents in the Life of a Slave Girl, Written by Herself originally published under the pseudonym Linda Brent in 1861. I read about her remarkable life in college and have been fascinated with her story ever since. A literary pilgrimage can take many forms. It can mean a visit to a deceased writer’s home or estate, or a walk about their favorite town or city, exploring places that were important to them. It can be refreshing to take a break from your writing routine and connect with a writer that you admire by visiting places that shaped them. Not all literary pilgrimages are arduous, but this one had elements of difficulty. My partner Tim and I were going to begin our trip with our godsons (visiting from Minnesota), by first going to Edenton and then ending up on Ocracoke Island. When I initially called the Historic Edenton Visitor Center to arrange a tour, I discovered that they would be closed on the first leg of our trip. And, I also discovered that only certain docents conducted the Harriet Jacobs tour and work on certain days. So we rearranged our trip so that we could get there later in the week, thus ending our sightseeing in Edenton before heading home. A few days into the trip, I called a second time to arrange a tour. During this call, the person explained that the main ‘Harriet Jacobs docent’ was out on vacation, but perhaps another person who occasionally did the tour could fill in. But, the person on the phone sounded skeptical that this other docent was going to be available. She said that there were materials available for a self-guided tour. I thought OK, we’ll just show up and do the self-guided tour. Not ideal, but doable. The afternoon we arrived in Edenton, we were tired and it was already close to 90 degrees. This the last leg of our trip after watching wild ponies in Ocracoke, seeing the Lost Colony play in Roanoke, and feeling the exuberance of invention at the Wright Brothers’ exhibit in Kitty Hawk. It also looked as if it was going to rain which made me doubt everyone’s willingness to do a self-guided tour. We were in luck, however, for when we arrived at the Visitor Center, we were met by an older woman named ‘Miss Carolyn’ (a native of Edenton), and she graciously walked with us and gave us a thorough 90 minute tour. Although not the primary docent on Harriet Jacobs, she was a great resource and an enthusiastic guide. The brief story about Harriet Jacobs goes as follows: Although they were enslaved, the Jacobs family had a great deal of relative freedom in the small town of Edenton. Her father was an accomplished carpenter, her grandmother, a well-known cook. After her mother’s death, Harriet went to live in the home of her owner Margaret Horniblow; Margaret taught her how to sew and read. It was assumed by Harriet and her family that Horniblow would emancipate her. Unfortunately, this was not the case and Harriet and her younger brother found themselves in the home of Mr. Norcom (there seems to be some historical evidence that Mr. Norcom somehow interfered with Horniblow’s wishes and/or will). Mr. Norcum became obsessed with young Harriet and made many sexual advances on her. At the time it was common that enslaved women were often sexually brutalized by any white man that lived on the plantation (or off). After dealing with this terrible situation for several years and trying other remedies (including beginning a liaison with Samuel Tredwell Sawyer, an unmarried, powerful white lawyer and future US Congressman), Harriet ran away and went into hiding. She first hid in the homes of friends, in nearby ‘Snaky Swamp’ and later in the home of her grandmother Molly. Harriet hid in her grandmother’s small attic above a storeroom for six years and eleven months. Norcom continued to search for her and briefly jailed her children (children from the liaison with Sawyer), her brother and an aunt hoping to flush her out. She successfully escaped in 1842 and made a life in New York. Norcom and other members of his family continued to search for her. She was able to buy her children’s freedom and became prominent in the abolition movement. She completed Incidents in 1858. She had bad luck initially as two book publishers who acquired the book both went out of business before it came to print. Harriet purchased the plates of her book and had it printed in 1861. This endeavor I imagine cost a small fortune. I had forgotten that self-publishing options were often a route for disenfranchised people to make their voices heard. She published it originally under a pseudonym as to protect the living members of her family still in slavery. We were able to visit the church that Harriet and her family attended, the jail where her family members were imprisoned and the harbor where she escaped as part of the Underground Railroad. We also walked and looked at places where houses once stood that Harriet hid in. 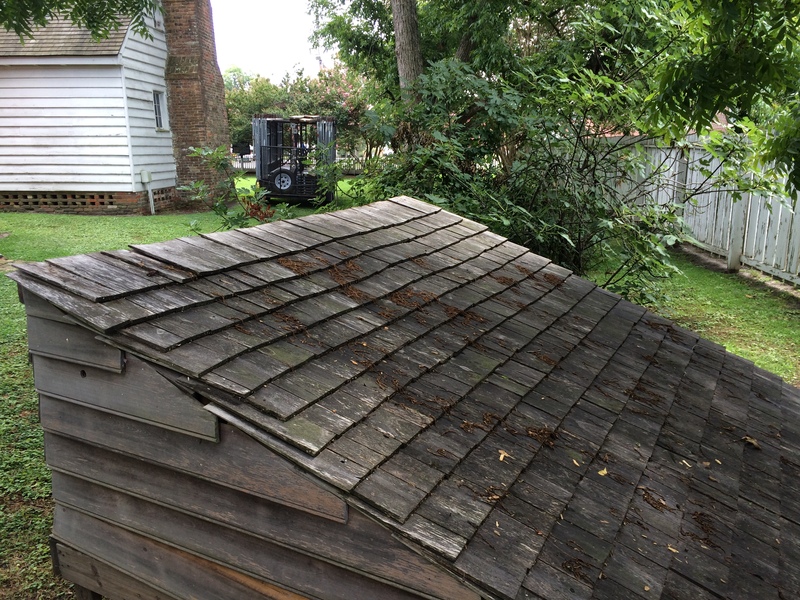 The property of the Visitor Center has created a replica of Molly’s attic where Harriet hid. She was able to sit up, but could not stand up. She had a small peep hole to look out of and the entire area was about 11 feet long, 4 feet wide and 3 feet high. Her grandmother would bring her food and occasionally she could come down, but the majority of the time was spent there. I can’t imagine the ways in which Harriet had to keep her mind occupied. Amazing. My eldest godson Andrew, who is 14, had read the book last year for class, so he knew many of the details. It was so nice to share a piece of history with them. The power of the word is remarkable and has often been used to fight injustice. 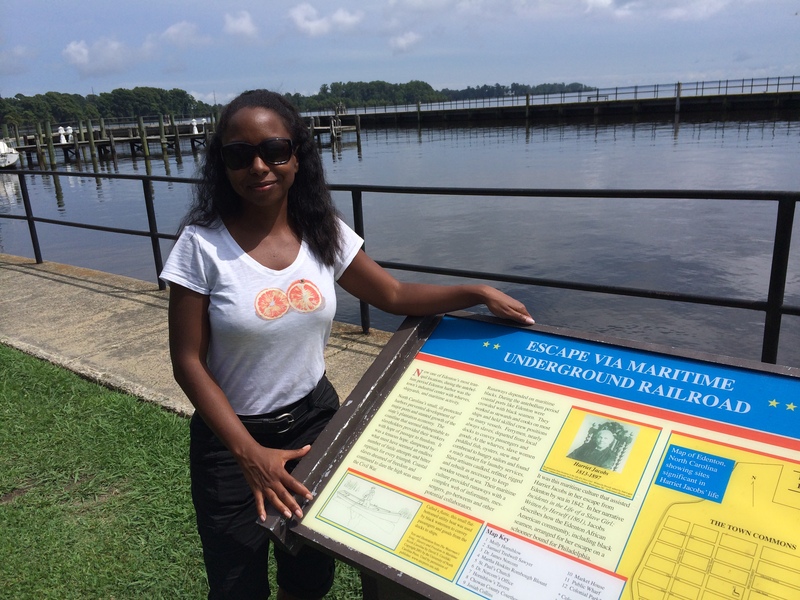 I felt truly moved walking around Edenton and thinking about Harriet. If any of her family members’ graves had been marked, I would have left something on them as an offering, but unfortunately that was not the case. I have only scratched the surface in recounting the highlights of the life of Harriet Jacobs. For more, read Incidents in Life of a Slave Girl, and visit this site. I’d love to hear if you’ve gone on a literary pilgrimage or are planning one. We were in luck, however, for when we arrived at the Visitor Center, we were met by an older woman named ‘Miss Carolyn’ (a native of Edenton), and she graciously walked with us and gave us a thorough 90 minute tour. Although not the primary docent on Harriet Jacob, she was a great resource and and enthusiastic guide. We also walked and looked at places where houses once stood that Harriet hid in. The property of the Visitor Center has created a replica of Molly’s attic where Harriet hid. My eldest godson Andrew, who is 14, had read the book last year for class, so he knew many of of the details. It was so nice to share a piece of history with them. The power of the word is remarkable and and has often been used to fight injustice. I felt truly moved walking around Edenton and thinking about Harriet. If any of her family members’ graves had been marked, I would have left something on them as an offering, but unfortunately that was not the case. I have only scratched the surface in recounting the highlights of the life of Harriet Jacobs. For more, read Incidents in Life of a Slave Girl, and visit this site.